Every Spider-Man fan knows Peter Parker's origin story, knows about his clashes with the Green Goblin, and is eager to see actor Tom Holland don the red and blue suit on the big screen. But do you know the genesis of Venom or the Sinister Six? Have you ever tried Aunt May's famous wheatcakes? 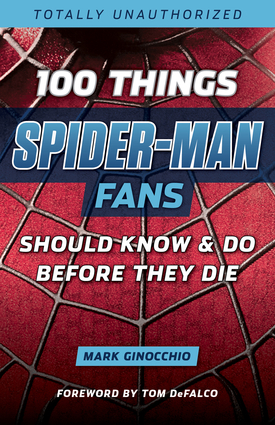 100 Things Spider-Man Fans Should Know & Do Before They Die is the ultimate resource for true fans of the character. Whether you're a die-hard comic book reader from the Silver Age or a new follower of the popular movies, these are the 100 things all fans need to know and do in their lifetime. Writer and podcaster Mark Ginocchio has collected every essential piece of Spider-Man knowledge and trivia, as well as must-do activities, and ranks them all from 1 to 100, providing an entertaining and easy-to-follow checklist as you progress on your way to fan superstardom! Mark Ginocchio is a writer and editor whose work has appeared in newspapers, magazines, corporate publications, and websites such as CBR, ComicBook.com, WhatCulture, and Sequart. He is the founder of the Chasing Amazing blog, which documents his quest to collect every issue of Amazing Spider-Man comics, and is a co-host of the Amazing Spider-Talk podcast. He lives in Brooklyn. A former editor-in-chief of Marvel Comics with over 50 books currently in print, Tom DeFalco has written comic books, graphic novels, short stories, prose novels and books like Spider-Man: The Ultimate Guide and Comic Creators on Fantastic Four. DeFalco is also known for writing characters like Spider-Man, Thor, Fantastic Four, Spider-Girl, Superboy, Hawkman and Archie. Aside from recently writing single issue stories for Justice League of America and Flash for DC Comics, he wrote a brand new Reggie & Me series for Archie Comics. Few characters in American fiction or history are more recognizable than the figure of Spider-Man. From his appearance in 1962’s Amazing Fantasy #15 to his return to the big screen in 2017’s blockbuster film “Spider-Man: Homecoming,” the web slinger has cemented his place in modern pop culture. 100 Things Spider-Man Fans Should Know & Do Before They Die provides a thoughtfully ranked list of the key characters, events, history and personalities surrounding the iconic super hero. With stories to educate the young generation of fans and take diehards down memory lane, this great new reference title brings value to readers of all stripes. Mark Ginocchio is a writer and editor whose work has appeared in newspapers, magazines, corporate publications and websites such as CBR, ComicBook.com, WhatCulture, and Sequart. He is the founder of the Chasing Amazing blog, which documents his quest to collect every issue of Amazing Spider-Man comics, and is a co-host of the Amazing Spider-Talk podcast. He lives in Brooklyn.